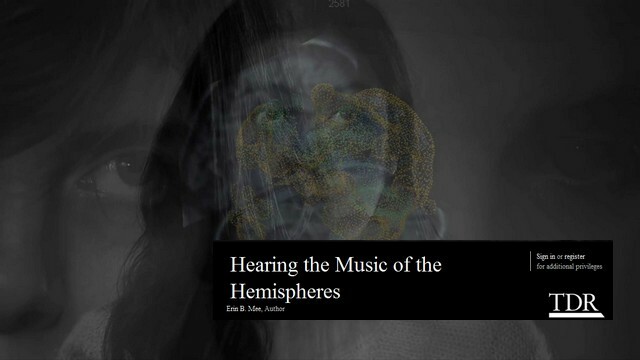 Hearing the ‘Music of the Hemispheres’ includes film, video, and audio clips that are integrated in, and central to, its argument. The article uses Scalar as a tool to embody as well as analyze the multimodal and multi-linear ways performance unfolds, and allows for a performance-driven mode of scholarship that enacts the performance-driven model of spectatorship under analysis. The article analyzes a concert in which music was composed by sonifying fMRI scans made of subjects as they watched a stimulus film instructing them to imagine the sound of rain, listen to a recording of rain, and listen to a musical composition incorporating recordings of rain. This article uses Scalar to offer an alternative, performance-driven model for understanding spectatorship. Though analyses of spectatorship in theatre and performance studies have largely drawn from reception and reader-response theories in literary and cultural studies, performance is a multimedia and multidisciplinary genre requiring multiple cognitive strategies for making meaning. 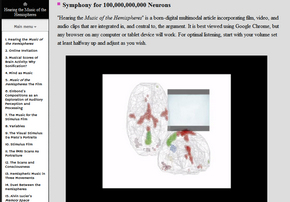 Hearing the ‘Music of the Hemispheres’ has just been published in The Drama Review (57; 3).